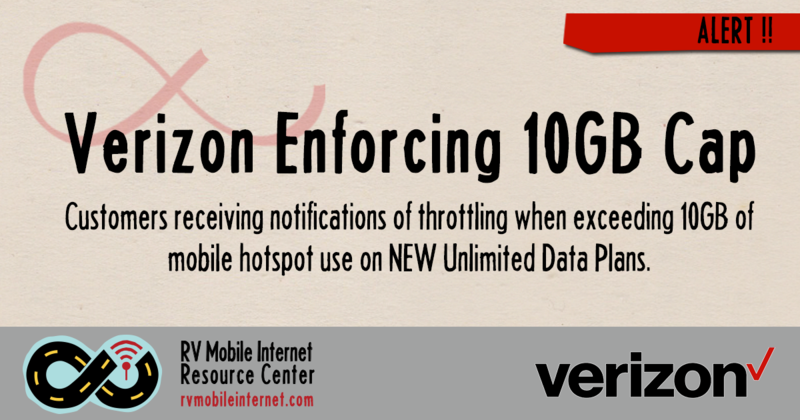 ALERT: Verizon Now Enforcing 10GB Hotspot Limit with New “Unlimited” Plan! 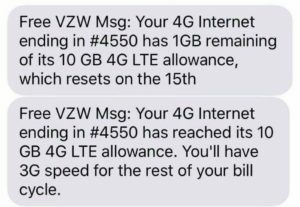 Verizon customers who have enjoyed the past few months of unlimited tethering began receiving messages like this today. When Verizon launched the new Verizon Unlimited Plan in February, the fine print clearly stated that hotspot / tethering usage would be limited to 10GB per billing period - with tethering speeds supposed to be throttled to a glacial 600kbps once that limit was crossed. But Verizon's own sales reps for the most part never understood the limit - and we heard several different "official" but incorrect explanations of how hotspot usage would actually be treated on Verizon's network. Things were made even more confusing because Verizon had launched the new unlimited plan without the backend accounting tools in place to track and enforce the usage limits. For the past two months it has been a free for all - with many Verizon customers able to tether well over 100GB on the new plan. Some Verizon sales reps were even telling folks this was how things were supposed to work - selling them expensive mobile hotspots to tap into all this glorious unlimited data and switching customers away from the higher tiered data capped plans that are now retired. A lot of people were hoping that the low cost unlimited free-for-all would continue. But the party seems to be ending. The 10GB limit is distinct from the 22GB network management limit. (see below for an explanation of the difference). The limit was per line (not per account). The 10GB limit applied to ALL hotspot/tethering usage. 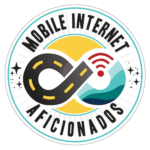 The limit was even intended to apply to mobile hotspots (Jetpacks, MiFis, etc) too - capping them at an effective 10GB/mo per line. The 10GB tethering data limit is NOT the same thing as Verizon's 22GB network management threshold. Verizon's new plans are ALL subject to network management after 22GB of usage in a month. When you cross the limit, Verizon will slow you down slightly relative to other customers - but ONLY when towers you are connected to are congested. Late at night or in less busy areas you will still get full speed. The 10GB tethering limit on there other hand applies only to hotspot / tethering usage, not to usage directly on a smartphone or tablet. But when you cross the 10GB limit, your ability to share your connection is slowed down to 600kbps 24/7 until your bill cycle resets - no matter what the level of tower congestion. If you are using a Jetpack on the new Verizon unlimited plan, you will never make it to the 22GB network management threshold in a month. You will be slowed to a crawl long before you get there. The grandfathered classic Verizon UDP however is not subject to the 22GB network management limit, nor the 10GB tethering limit. 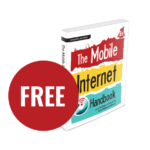 "The 10 GB for mobile hotspots is per line. So if you have three lines and turn on the mobile hotspot on each of the three lines, you will get a total of 30 GB, 10 per line. The speed is 600 kbps once the 10 GB on each line is reached." In other words - the new Verizon Unlimited Plan is great for phones or tablets - but not for hotspots and tethering. You can stream all the movies & television you want on your smartphone or tablet (even using a HDMI cable out to cast the image up to a larger TV screen) - but using a Jetpack or smartphone to get laptops or streaming devices online will quickly have you throttled to painfully slow speeds. We tried to warn people that it was only a matter of time until the rules ended up being enforced. And as of today, multiple Verizon customer are reporting receiving text messages warning them that they are out of data, dropping them to 3G speeds. 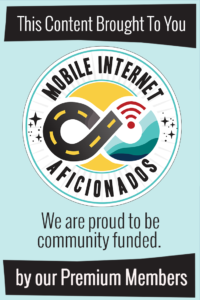 "We’ve noticed that you use more than 10 GB of data each month on your Internet device (Jetpack/router/Home Fusion Broadband). So, we wanted to remind you that, consistent with our Verizon Unlimited Plan terms & conditions, when you exceed 10 GB on that device during your monthly bill cycle in the future, your data speeds will slow down to a maximum of 3G speeds. 4G speed will be restored when your monthly bill cycle begins again." Yep - even for hotspot lines. The enforcement appears to be rolling out across the board - it just may take some time to get to everyone. We've now heard from some folks who have even gotten the notice in the middle of their billing cycle. Yes, it is still possible to get a grandfathered Verizon unlimited data plan without these new restrictions. But things are getting a LOT trickier! 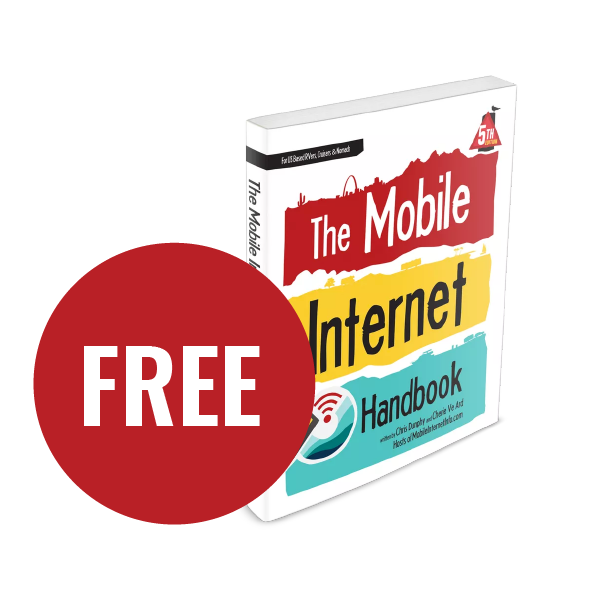 We keep our guide to how to do it updated regularly. The classic grandfathered Verizon UDP lines remain (for now) truly unlimited - and these plans are still the best way to get unlimited tethering data on Verizon's network. These legacy plans are NOT subject to tethering limits, or even to the 22GB "Network Management" slowdown on congested towers. For those who need a lot of tethering data - there is no better Verizon option out there. As best we can tell - these grandfathered plans without any of these new limitations will continue to be honored - IF they are still under contract. They're still obtainable by assuming liability of someone else's line and becoming a direct Verizon customer, or renting/leasing a plan from a corporate account holder (generally against the terms of service.). However, in the past few months we have seen Verizon actively terminating high usage customers with OUT of contract unlimited data plans. Both options have risks that you should understand before proceeding. We've seen some reports that out of contract grandfathered unlimited plans may be forced to transition to the new Unlimited Data Plan - losing the ability to tether more than 10GB, or avoid network management. If you have an out-of-contract grandfathered plan and these features are important to you - get back under contract ASAP! 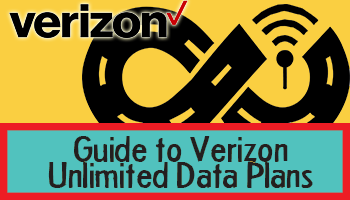 We have been providing in-depth guidance in the member forums and in our Verizon UDP Guide on the current best practices to keep plans under contract, and hopefully out of Verizon's crosshairs. And our guide has all of the current best practices for obtaining these lines, and contact information for data brokers who can facilitate rentals and assumption of liability (much of this guide is a premium member exclusive). 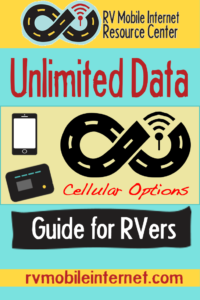 We know how critical unlimited data plans are for RVers, so we strive to keep this guide always up to date with ALL the latest options. AT&T's new Unlimited Plus plan allows you to add mobile hotspot lines for as little as $20/mo (if you only have one smartphone line, the addition of a hotspot line switches the plan to a multi line account for a minimum price of $145/month) - and while these lines are subject to network management after 22GB, they are NOT subject to any throttling or hard caps on usage. And AT&T's Connected Car plan and Mobley device enable unlimited hotspot usage for just $20/mo - no smartphone line required. This special pricing was launched as a limited time promotion until July 2017. T-Mobile's One+ International plan for $95/month includes unlimited high speed mobile hotspot use from a smartphone, and remains a great option. 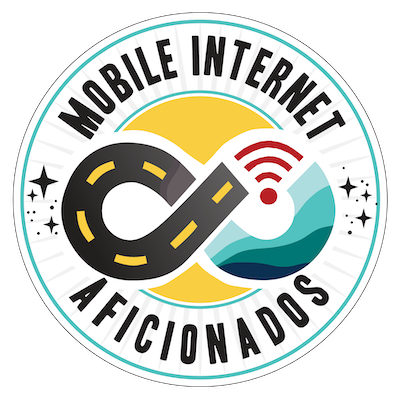 We are also tracking several other unlimited data options that are not direct from the carriers, which can be found in our Unlimited Data Guide. These plans, and unlimited data options from other providers, are constantly changing - so do be sure to keep your eye out for the latest developments.